I didn't think any existed past the 10th? i would love to see a ton of "zero's" on the end too. Glad i added them, it gives the graph a lot more punch than just blank spaces. I don't know. But there is no way he is just handing it over. I wouldn't. Will probably post something on Facebook about how his own sponsor is dragging him through the mud. 300 comments will be "gutted" for him. He will tell SKINS to stuff it, and they either will, or he'll just find another sponsor who enjoys all the social media hype he generates, unless the heat is kept up with major media outlets exposing this guy. Either SKINS was in on it or their employee is a complete moron for not notifying the home office of the shenanigans. Will be very skeptical of independent investigator if they try to sweep it under the rug. Yes I am lazy and don't want to do my research myself. But throw me a bone. Is skins a real company that sells much of anything? I have never heard of such gear. What are their revenues? Surprised Asher never checks in anymore. Seems he was vindicated. Do you think the whole statue thing has gone to his head? Roughly $85M in revenue in 2014. Yes, real company, but no, doesn't sell much of anything. I tried to get them to sponsor me a couple of years ago (I'm regionally competitive, this seemed like a decent matchup) but never got much response. Glad I didn't pursue it. They had some weird social media site set up for self promotion in order to get their attention. Glad to see this narcissistic, fraudulent a-hole getting some degree of come-uppance. Er... no, #59 is Gary Allen who is a hell of a lot better runner than I am. I was Maniac #111 before I got kicked out of the club and erased from existence by #3. Another story for another time. Psssst. What's worse than being a member of the Marathon Maniacs? Being in it or being kicked out of it? I think this whole thing was a huge team effort or you could say: "Crowdbusting"
Skins USA doesn't seem like much of a company. If you go to their website and look at their USA address then google a street view of it, it looks like an apartment in a low grade neighborhood. Logical new pet name for the RY sponsor/cover up partner, Skins ; Spins. It's entirely possible that there was some early hanky panky in that skanky RV. Maybe Mr. Michael Speicher got caught in a compromising situation with a sausage in his hand. And then maybe the British blokes blackmailed him into going along with the scam. Stranger things have happened. You've done great work Markus. I like how posting his splits that they provided is "hating"
I ran with Rob for a mile or two at an event (equinox24) almost two year ago. 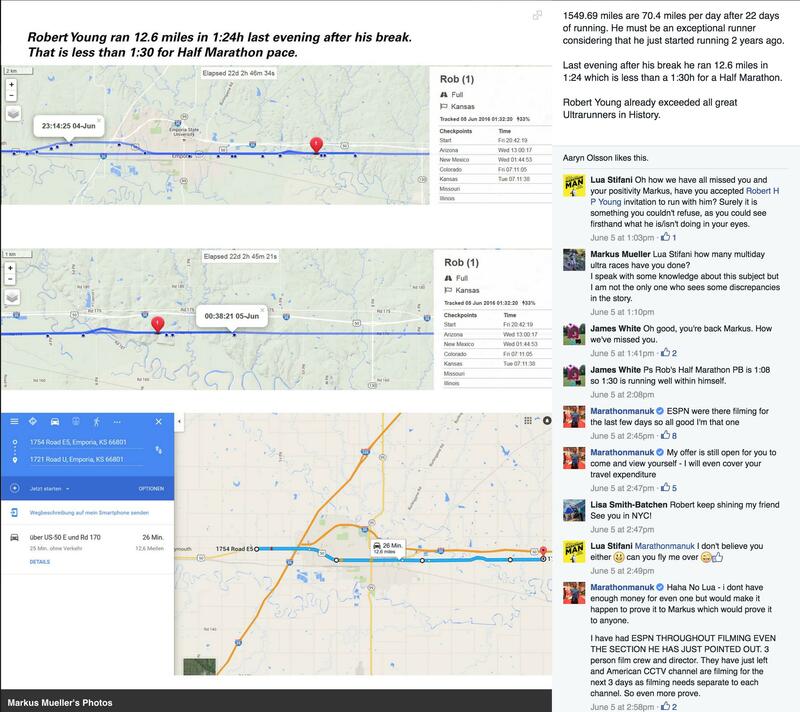 I was impressed with what he was attempting (more than a marathon aday for a year) though thought it strange he wasn't on Strava or any other running app. Hearing that he has cheated, is extremely annoying! It makes you question his other ultra achievements. Over here he is supported by so many, who may not hear of this. He is listed to run Equinox24 again as a pair in September. This kinda pisses me off. Wow. Great graphic. That is really telling! I wonder if it would muddy things up if you added the total miles run above that pace for each day, or the number of hours running and/or resting? And yeah, his one marathon a day achievement is a scam as well.